Sue Stratman holds the microphone for her son, Daniel. Sue Stratman’s doctor advised abortion, warning that her daughter might inherit the same heart condition of her son, Daniel. But Sue and her husband, Jay, were unwavering in their pro-life beliefs and she continued her pregnancy, giving birth to a healthy daughter who is now 31 years old. Her first challenge occurred after he was born with a heart defect, requiring open-heart surgery when he was five days old, and again at age 8 and age 10. In July 1996, Daniel underwent a routine hernia surgery but emerged with significant brain damage, blindness and the inability to walk because, she said, the anesthesiologist failed to set the blood pressure machine and set the anesthesia too high for too long. Stratman not only forgave the anesthesiologist and other hospital workers, she continued a faithful life of service, caring for all of her children, sharing her story in a book by Dianne C. Reynolds, “When Losing is Winning” and making speaking appearances like the one on Monday. 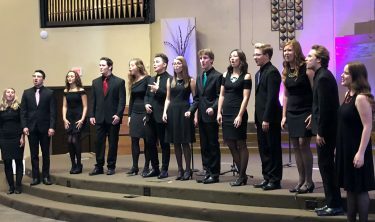 Critical Mass, GCU’s a cappella ensemble, performed. 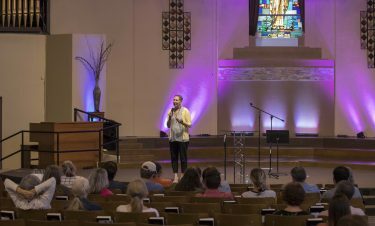 The audience of GCU students and local church community members, included Morgan Clarke, a junior psychology major who was moved by the Stratman family’s experience. 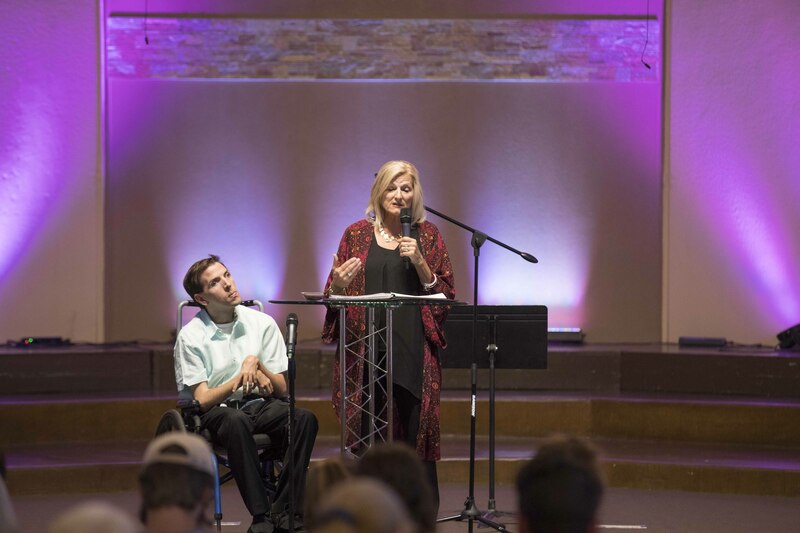 Stratman and Daniel were among four speakers at the event, which began with Chapel speaker Joni Eareckson Tada, founder of the nonprofit organization Joni and Friends. Among other initiatives, the organization provides wheelchairs for people all over the world. Tada has been confined to a wheelchair since she was injured in a 1967 diving accident. 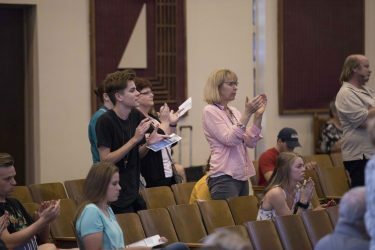 “Joni’s message resonated with our students, ’’ said Kimberly LaPrade, Dean of the College of Education, noting the thousands of students at GCU Arena who gave Tada two standing ovations. Scott Klusendorf debates for pro-life at the conference. After Chapel and lunch, the event moved a few hundred yards to the First Southern Baptist Church, adjacent to campus. Critical Mass, GCU’s a cappella ensemble, performed an assortment of energetic religious songs, followed by the opening remarks of GCU President Brian Mueller and a prayer by Dr. Tim Griffin, Pastor and Dean of Students, who served as the emcee. 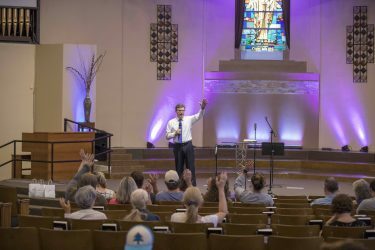 Scott Klusendorf shared his powerfully logical and passionate pro-life message, guiding the audience through strategies to debate people who favor abortion. He emphasized the lack of difference between an unborn human and a born human, as in what justifies the killing of the unborn? The four main differences, as enumerated by Klusendorf, are Size, Level of development, Environment and Degree of dependency, remembered with the acronym SLED. In terms of size, for example, Klusendorf reasoned that if killing a toddler is immoral and illegal, then so is killing the smaller human, the unborn. Similarly, how does being a less developed human, the unborn, disqualify the unborn from protection? In terms of environment, the changes from the womb to outside the womb should not affect the value of a person, according to Klusendorf. As for dependency, toddlers need their parents for nutrition and safe surroundings, just like the unborn, and dependency should not disqualify the unborn from being treated as a person, meaning free to be born. 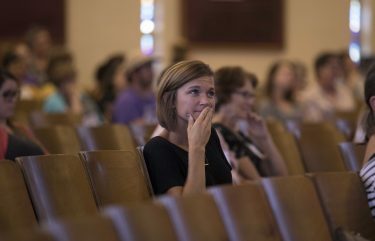 An audience member reacts to the heartbreaking loss described by the speaker. “They assume the unborn are not human, so when you are arguing with people on this issue ask them, ‘Does it apply to killing a toddler? '” Klusendorf said. He also compared the development of a human to that of a Polaroid camera — the picture is there, and it slowly appears on the photo paper. He exhorted his audience to follow three steps: 1. Clarify the issue; 2. Defend your pro-life position with science and philosophy; 3. Challenge your listeners to be intellectually honest. In an interview afterward, he said, “Our country is having a huge argument over two key questions that impacts every student at Grand Canyon University, every one of their parents, and their kids and grandkids for generations to come. Our nation is quabbling over the question of what makes humans value and is moral truth true with a capital T, or is it just a preference like choosing chocolate ice cream over vanilla? The audience shows appreciation for the passionate speakers. 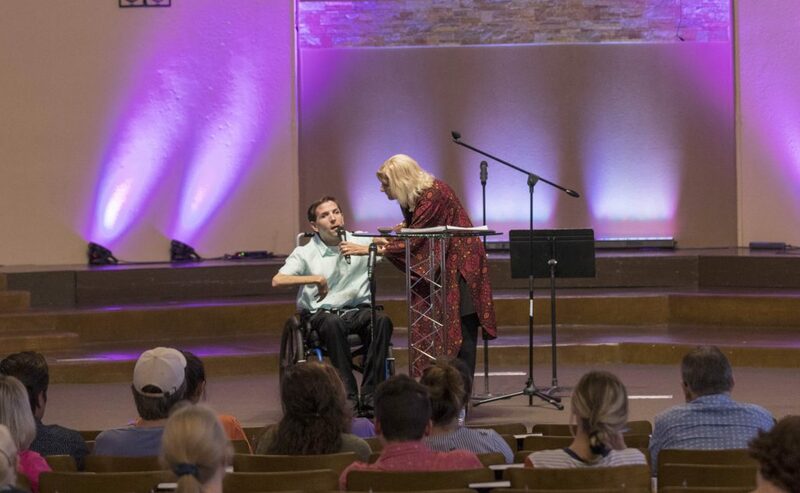 After Klusendorf’s intellectually oriented speech, courageous, heart-filled tales were told by Sue Stratman, who included comments from Daniel, via lip reading – for two years after the botched hernia surgery he could not speak, and his atrophied vocal cords have not regained their volume. Another anecdote Stratman shared represented another moral dilemma. After traveling numerous times from their St. Louis home to Florida for treatment in a hyperbaric oxygen chamber, which improved some of Daniel’s functions, the doctor strongly advised the family to travel to the Dominican Republic for stem cell transplants from aborted fetuses. In a most recent example, Daniel prepared for a trip to Israel by listening to the entire Bible seven times. The final speaker, Suzanne Helzer, a nurse manager at First Way Pregnancy Center in Phoenix, works daily with women in crisis pregnancies. Helzer, a recent cancer survivor, shared her story of being a teen mom and giving up her baby for adoption. Now, she works with families who are dealing with loss at the start of life, including from abortion, miscarriage and stillbirth. In that vein, Helzer spoke of things parents can do before saying goodbye to their child, including naming the child, holding the child, bathing the child, putting lotion on the child, dressing the child, taking photos and planning the child’s funeral. “Opportunities like these should be provided at all hospitals and birth centers,’’ she said. Helzer also spoke of involving the entire family in the grief process. Suzanne Helzer enumerates ways to maximize the brief opportunities for parents experiencing loss at the start of life. Clarke recently completed a child and adolescent development class and is taking an adult development class. The impactful conference concluded with a panel discussion involving all the speakers. It was quite interesting as audience members asked insightful questions ranging from tips for arguing with a pro-abortion utilitarian to placenta cord blood banking, to use of cooling cots to extend the life of a baby who is dying, to the grief experienced when one twin survives and the other dies. This post is very good for those who have experienced any kind of close loss of life. It is very hard grieving for a loved one, especially if that loved one was very close to you. You might also miss them and imagine every moment that you could be with them. But because of our faith, there is a chance that we might meet them again with God. I enjoyed this post as I have lost a very good friend in a very violent way and it took my family and I a long time and a lot of questions to God. We know he is with God in his kingdom and we will see him again one day. This is an extremely relevant topic to the dilemmas in society today. I was really happy that Sue Stratman continued to stand by her beliefs and opted to not travel to the Dominican. I remember reading in an article that a person can obtain stem cells from their own body, such as their bone marrow. Granted I am not a doctor and I have not researched the topic, but I thought that was interesting and it made me wonder if that could be an alternative to getting stem cells. Wow! It sounds like it was a great conference. Helzer made a good point about needing to treat the whole family when a baby passes away. The whole family is effected no matter what anyone tries to tell you. I cannot and will never understand why someone want’s to kill a precious unborn child. To me each life is precious and each child deserves a change to life.